Larfleeze, alongside Atrocitus and Kry'b from previous waves, is an example of everything DCD can do right. A fantastic, unique sculpt not tied down by common bucks, and an unusual, new alien character with whom scale isn't as major factor. A beautiful headsculpt that captures the King of Greed perfectly, with groovy elongated arms and the requisite orange lantern. The Glomulus pack-in is icing on the already delicious cake - and Glomulus is even articulated! Magic stuff. 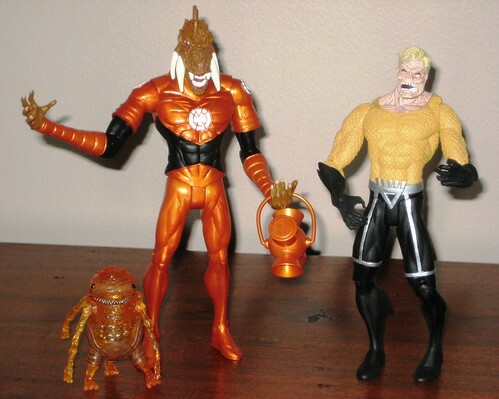 As AFB's #1 Aqua-fan (yeah, I know AFB is me, but we've had fights about this one, trust me) I was only going to consider the Black Lantern Aquaman figure if I knew that Blackest Night was the vehicle to his return to the land of the living. Now that the BRIGHTEST DAY teasers suggest strongly this is the case, I'm happy to have this on the Aqua-shelf as a "phase" Arthur went through. Great sculpt here - the face is truly horrid and the legs are bowed in. Very nice zombie - er, Black Lantern work. Star Sapphire is a rehash of DCD's most recent release in the Green Lantern series, so I'm passing on it, but - ooh..... her purple sections are transparent and glittery! What the heck? This figure isn't setting the world on fire, but as a member of the seemingly inevitable DCD Rainbow Lantern Corps she'll do fine. For some reason this version is quite easy to stand, where as the GL version is topple city. Go figure. Oh, I mentioned DCD's standard dose of heart-wrenching calamity? Ladies and gentlemen of the jury, I present to you Arisia, long neglected in plastic Green Lantern Corps member, and the uber-disappointing trainwreck of the wave. Apart from the unsurprising fact that scale-wise she'll stand too tall against many previous DCD GL releases, the quality on this figure is lacking. It looks like orange-ish coloured plastic has been used here instead of paint, and that impacts on the feel and quality of the finished product. Nice to have, but instead of finally having one of my grails in my hand, I'm left hoping DCUC gets to Arisia soon. Far from surprising, but painful just the same. Still, DCD's BLACKEST NIGHT efforts are giving us some great sculpts of some significant Modern Age characters that will work in a GL display for years to come, and I'm grateful for that. I'm not going the Black Lanterns in a big way, but there's some goodies to be cherry picked here. It's just a shame to have to cherry pick from something that should be such a better big picture. You can see more pics at Facebook, discuss this at the AFB Forum, and comment on this post to enter the AFB March Comment of the Month Contest! ** This month AFB's Facebook Fans have an extra chance to win - so become one now! 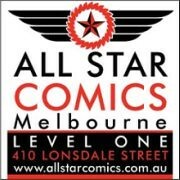 Oooh I'm really keen on BL Aquaman! Well, I think I've liked all the BLs I've seen so far. I do like the clear effect used on Star Sapphire. And Larfleeze is prolly the best figure in the line thus far. I couldn't wait to get Larfleeze! I didn't think Arisia was that bad, but the scale thing is annoying. But I really think DCD should stop with the "fans won't notice" attitude as we're not 9 years old and I respond by not buying 98% of their stuff. 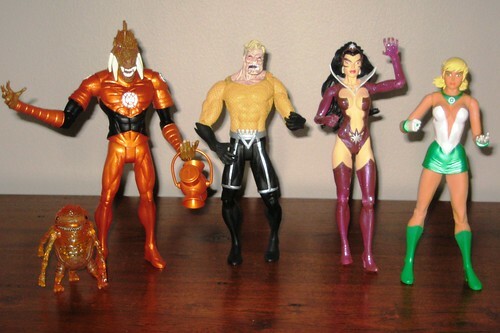 good luck to to the monthly winner if they choose Larfleeze, that is a gorgeous figure. I've just realise that I've been visiting this blog for ages & I've always enjoyed it. It's high time I expressed my appreciation for the work you do here. My best to you, sir. Key problem with DCD is still the low level of articulation. It's fine if you just want to pose the thing on a shelf in some basically mandated pose, but the lack of flexibility is maddening. The still look alright for the most part, but there's always that let down. 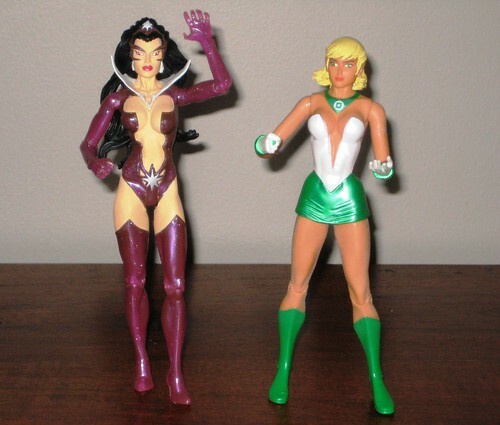 Curiously, a couple other reviews of Arisia mentioned the cast-in-color as a good feature of the figure, rather than being painted. I think she looks pretty darn good, and I don't care how tall she is compared to the DCUC figures she'll be displayed with. I really am liking these series of figures. can't wait for more. Larfleeze shows that the other corps do not have to be just human type characters in green latern and though it was creepy when Kryb came with kids but to now know Glomulus has articulation blackest night figures are getting on the creepy side. star sapphire if they used the original mold will not stand any way and Arisia one should be happy she got a figure after so long. Larfleeze is definitely the star of the wave. Damned shame DCD can't figure out the scale they want to use on these guys. No reason for there to be so much inconsistency within every sub-line.